After an aerial somersault, an acrobat lands perfectly on the teeterboard and raises his arm with a Shah Rukh Khan flourish. Take a closer look, he’s out of breath. When the lights come on during the intermission, the Delhi smog hangs heavy inside the tent. This is not surprising, considering Cirque du Soleil’s Bazzar has set up show in Aerocity, Delhi. Their show in Mumbai was definitely easier, they agree. They’ve been touring for nearly two months now with Bazzar, which debuted in India instead of Montreal. The theatrical company from Canada, with an annual revenue of nearly Rs 6,000 crore, has brought the circus into the politically correct world. Minus animals, plus state-of-the-art special effects, props and stories and themes. Touring shows, such as the one currently in India, are smaller than resident ones. Popular Las Vegas shows such as The Beatles LOVE or O are spectaculars at par with Broadway fare. But Bazzar is an exceptionally small act, with a troupe of about 30 artistes and minimal automation or special effects. It is almost underwhelming. On the plus side, the attention is entirely on the tricks of the athletes rather than on the effects or on the theme. It’s true that the air quality in Delhi has made the job of Bazzar’s teeterboarding trio more difficult. But better air quality does not make their job easy. Since the time of great showman P T Barnum, teeterboarders, like most circus acrobats, have pulled it off by the skin of their teeth. What looks effortless during the performance is actually precarious. Watching a practice video on Instagram can make you breathless with apprehension. Acrobats leap off what looks like a playground seesaw and jump higher and higher, adding multiple flips. When one lands, the other is flung up and they switch places in the middle of all of that. 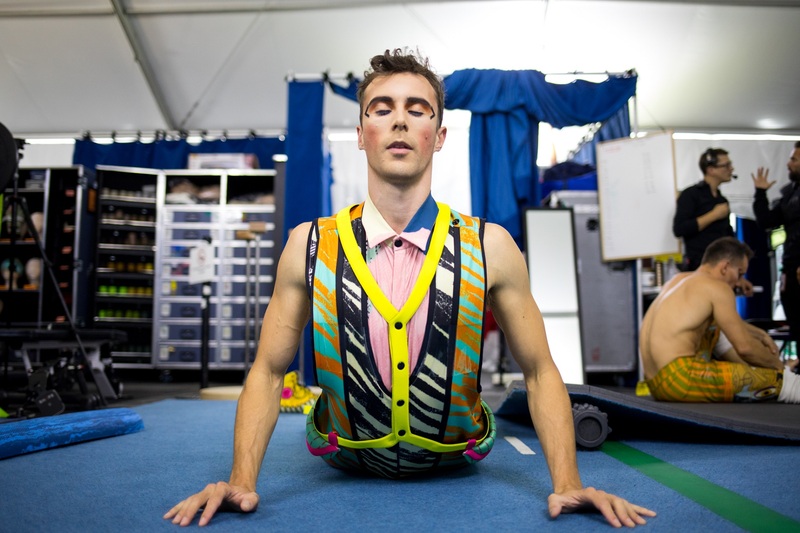 Patrick says, “Teeterboarding never gets stable.” Patrick started his career with Cirque do Soleil but has participated in avant garde European performances before returning to the company. “There is 10 percent luck involved. If we are suddenly a meter higher, it changes everything – the rotation, the dynamic. Up in the air, you have about 1.8 second to adjust and react,” he adds. The trio is constantly shouting calls at each other for adjustments. The person on the ground often rushes to stabilise the others who land. They depend on each other for their safety. In fact, getting it right is critical for that very reason. “If I make a mistake in my own trick, it’s okay. But if it affects my partners, that can upset me for the whole day,” says Pablo. When the teeterboarders get philosophical, all three agree on one thing. Their profession is about finding that balance between adrenaline and calm. Calm? When you have to land exactly on the edge of a seesaw after a high-jump? “There has to be a balance. Too calm, is bad, too nervous, bad,” says Slava. But seriously, what if something does go wrong? All three are silent. It’s clear that they don’t really think of that as an option. In March 2018, a Cirque du Soleil aerialist Yann Arnaud fell during a performance in Florida and died at the hospital later, according to media reports. Sarah Guyard-Guillot, a French acrobat, fell to her death in 2013 during Kà in Las Vegas. The existential question over the cost of entertainment continues to apply to every form of circus – be it traditional Jumbo fare we grew up with or these contemporary acts. Whatever the pain of pulling it off, the Delhi audience laps up the acts. Every motion draws a thunderous applause. Slava, who has been with Cirque du Soleil for a decade now, says there was a show for underprivileged children in Bombay. “We’ve never had an audience that squealed and shouted more,” he says. That this particular show is basic has not affected its popularity. Patrick thinks that too many special effects, in fact, take the magic away. “There is a wolf-pack simplicity when the focus in on the human factor,” he says. Bazzar has integrated two Mallakhamb athletes into its routine. And they have the loudest cheer from the audience. It’s hard to walk away from Bazzar without wondering if the Indian circus can be resurrected with a focus on upgrading the resources for athletes. After all, the fundamentals remain the same – trapeze, tightrope, roller-skating, etc. Given Bazzar has been running to packed house, it’s clear that India is starved for circus, the national drama on news channels notwithstanding. A TV crew is shooting an interview with the Mallakhamb artistes. When it’s the turn of another acrobat to go in front of the camera the Mallakhamb practitioner removes his jacket and gives it to his colleague. It brings to mind the camaraderie of a travelling troupe and life before the lights turn on. But it’s time to perish the romantic stereotypes we’ve learned from Mera Naam Joker. Cirque du Soleil employees do not live behind the tent. They have been put up at hotels. They don’t run away to join the circus and train with those already on the troupe. There are specialised circus schools in Canada and Russia. They are hired for acts and get to go back to their families for months between performances. They can also bring their families to any of the innumerable countries they travel to. Most importantly, it is a financially stable career. “Especially if you work with this company,” says Patrick, who intends to start a circus-themed bar when he retires. What will Slava do after he retires? “Teeterboarding,” he quips.